There’s a cracking bit over on Sports Illustrated.com today in which Grant Wahl tells the tale of Abel Rodriguez, i.e, the 41-year-old Mexican man who went from waxing floors in Los Angeles to being Jose Mourinho’s guest of honour at the El Clasico back on March 2nd. Basically, Rodriguez has spent his last few summers taking a fortnight’s holiday from his day job to work as a volunteer at Real Madrid’s summer training camps at UCLA, assisting with setting out training pitches and collecting wayward footballs, etc, and after falling in love with Mourinho’s side, decided that he would like to go and see them play in Spain, specifically against Barcelona. With nothing but a posie in his buttonhole and a skip in his step, Rodriguez made his way to Madrid to watch the El Clasico game against Barcelona a month ago but arrived in the Spanish capital a couple of days before the match without a ticket or anywhere to stay. Rodriguez then explained the pickle he had gotten himself into, only for Mourinho to sort out a ticket for the game and a complimentary night in Real Madrid’s luxury hotel. 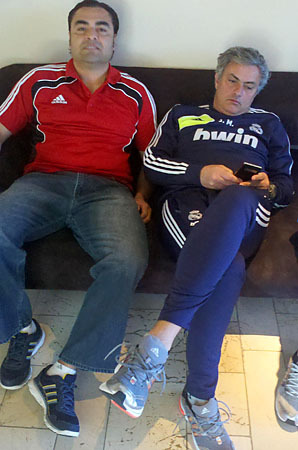 The pair then had dinner together the night before El Clasico and discussed Madrid’s upcoming Champions League tie with Manchester United, with Rodriguez wishing Mourinho the best and thanking him for his kindness. And, that dear friends, is pure distilled awesome juice. The enemy of football indeed. Love how SAF skipped the press to have a drink with Mou. Not the biggest Mou fan but he deserves RESPECT!!! Few coaches would do that! The sooner that people learn to separate Mou’s “panto villain” media persona (the sole purpose of which is to galvanise his teams) from his private persona, the better. We need more of these stories in football.